Network-attached storage (NAS) is file-level computer data storage server connected to a computer network providing data access to a heterogeneous group of clients. NAS not only operates as a file server, but is specialized for this task either by its hardware, software, or configuration of those elements. NAS is often manufactured as a computer appliance – a specialized computer built from the ground up for storing and serving files – rather than simply a general purpose computer being used for the role. Network Attached Storage (NAS) devices are storage arrays or gateways that support file-based storage protocols such as NFS and CiFS, and are typically connected via an IP network. These file-based protocols provide clients shared access to storage resources. This centralization of shared storage resources reduces management complexity, minimizes stranded disk capacity, improves storage utilization rates and eliminates file server sprawl. NAS devices typically leverage existing IP networks for connectivity, enabling companies to reduce the price of entry for access to shared storage. The RAID and clustering capabilities inherent to modern enterprise NAS devices offer greatly improved availability when compared with traditional direct attached storage. Because NAS devices control the file system, they offer increased flexibility when using advanced storage functionality such as snapshots. A SAN does not provide file abstraction, only block-level operations. However, file systems built on top of SANs do provide file-level access, and are known as SAN filesystems or shared disk file systems. 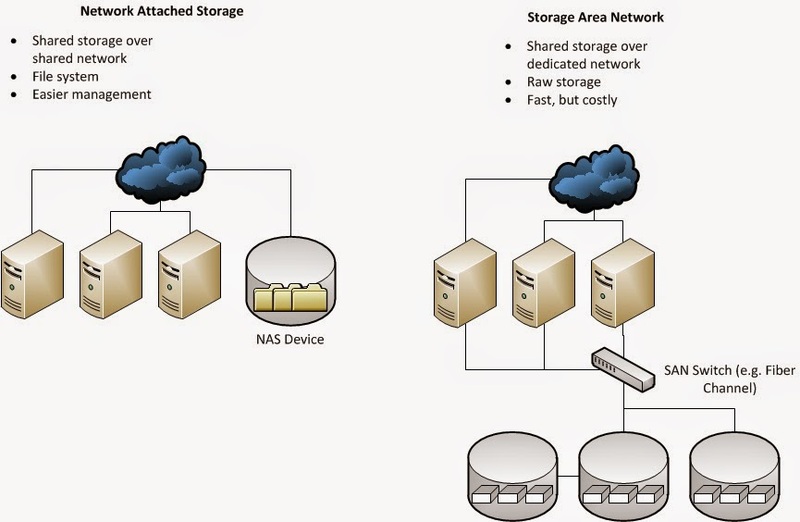 Storage Area Networks or sometimes referred to as SAN, are a separate computer network typically based on a fabric of fiber channel switches and hubs, connecting storage subsystems to a heterogeneous set of servers on an any-server-to-any-server basis. A SAN enables direct storage-to-storage interconnectivity and lends itself to taking advantage of new types of clustering technology. SAN vs NAS - What Is the Difference?Both Storage Area Networks (SANs) and Network Attached Storage (NAS) provide networked storage solutions. A NAS is a single storage device that operate on data files, while a SAN is a local network of multiple devices that operate on disk blocks. A SAN commonly utilizes Fibre Channel interconnects. A NAS typically makes Ethernet and TCP/IP connections. The administrator of a home or small business network can connect one NAS device to their LAN. The NAS maintains its own IP address comparable to computer and other TCP/IP devices. Using a software program that normally is provided together with the NAS hardware, a network administrator can set up automatic or manual backups and file copies between the NAS and all other connected devices. The NAS holds many gigabytes of data, up to a few terabytes. Administrators add more storage capacity to their network by installing additional NAS devices, although each NAS operates independently. Administrators of larger enterprise networks may require many terabytes of centralized file storage or very high-speed file transfer operations. Where installing an army of many NAS devices is not a practical option, administrators can instead install a single SAN containing a high-performance disk array to provide the needed scalability and performance. Administrators require specialized knowledge and training to configure and maintain SANs.